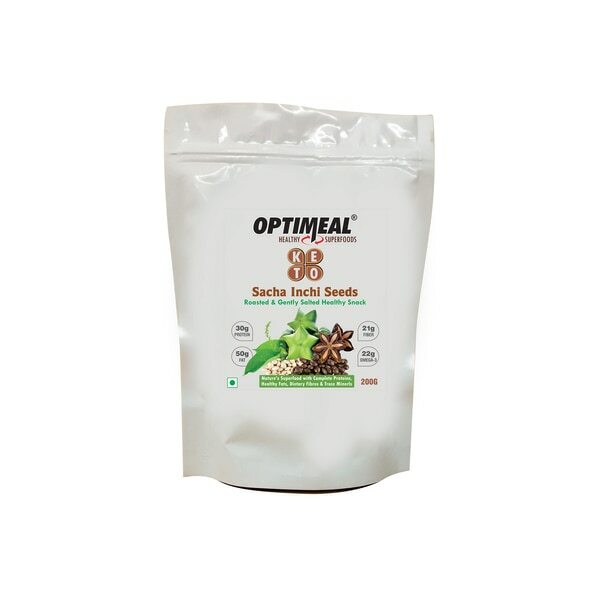 Multi Greens Super Food 7 Wonders of Green Food Combo Bio Chlorophyll XP known as best green supplement capsules, super greens supplement capsules, athletic greens, vital greens, greens capsules, Multi Greens Super Food in Chennai, India. KEY INGREDIENT(S): Wheat grass, Barleygrass, Alfalfa, Spirulina, Chlorella, Green Tea, Spinach and Vegetable Powder. 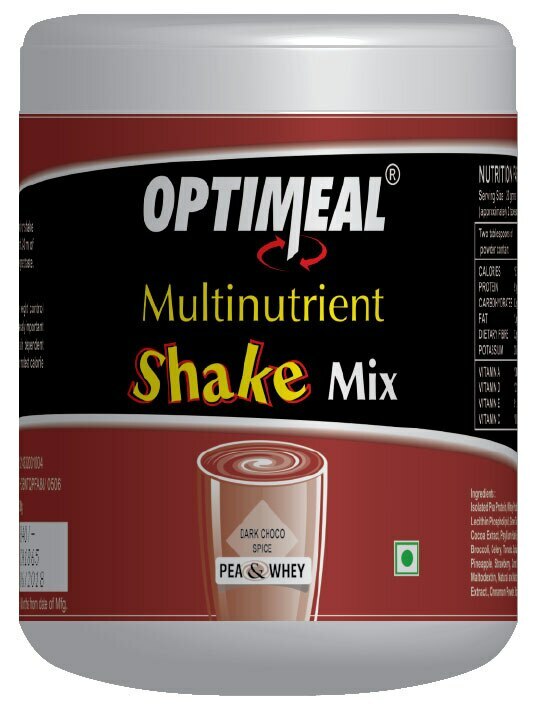 MAIN PRODUCT FEATURES: Multi greens super food formula. 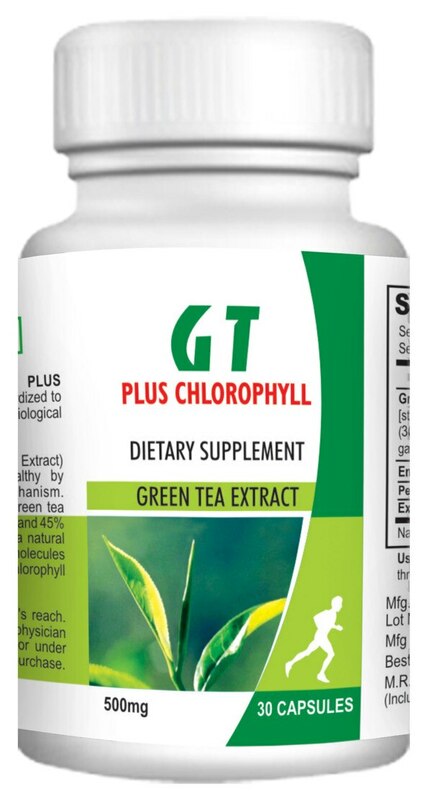 High Bio available chlorophyll. Contents SOD, GLA Folic acids. Phytonutrients from whole food extracts taken from Carrot and leek. 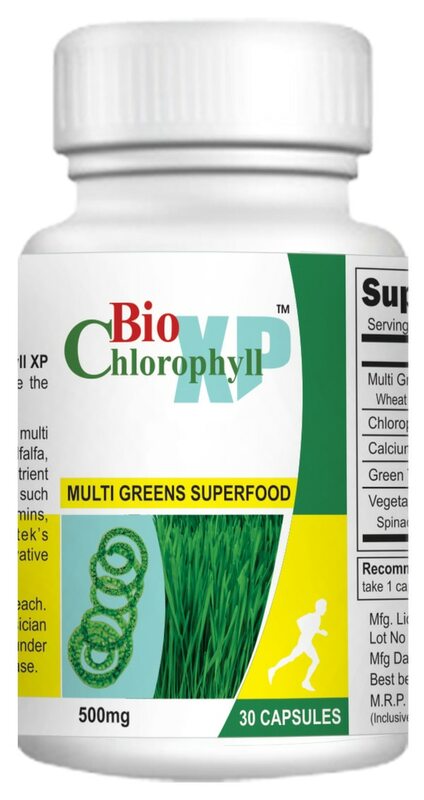 Health Benefits of Bio Chlorophyll XP Healthy Oxygenation. Heavy metal detox. Digestive tract detoxifier. Healthy Skin. Helps in blood purification. Balances Haemoglobin production. Reduces Blood pressure and low bad cholesterol. Helps in combating Anemia and Thalassemia. Controls diabetes and balance blood sugar. Controls Depression. People under a lot of stress with blood related disorders; people with digestive problems including acidity and skin related problems; those trying to overcome chronic inner ear inflammation and infections, people wanting antioxidant protection and liver detoxification. 30 Capsules Reishi and Noni supplement capsules manufacturer, dealer and supplier in Chennai, India. How to Protect the Immune System? The answer is in nature. Rare combinations of ingredients in the whole health supplement market for the better immunity. In market there is only neither Reishi nor Noni in capsule form. Especially high soluble Red Reishi used. Main Product Features: Reishi, also known as Lingzhi, is one of the most valued herbal products in Traditional Chinese Medicine (TCM). Reishi's earliest herbal remedies were recorded between 206 B.C. - 8 A.D. Lingzhi or Reishi is known by its scientific name of Ganoderma Lucidum. There are 62 types of Reishi, of which six are most common: RED Reishi is preferred because it can produce the highest quality extract and has been subject to the most scientific evaluation. Morinda Citrifolia, also called "noni" grows in shady forests, as well as on open rocky or sandy shores. It contains carbohydrates and dietary fibre. Noni is rich in Vitamins A, C, E, B, B2, B6, B12, Calcium, Iron, Niacin, Folic Acid, Pantothenic Acid, Phosphorus, Magnesium, Zinc, and Copper. 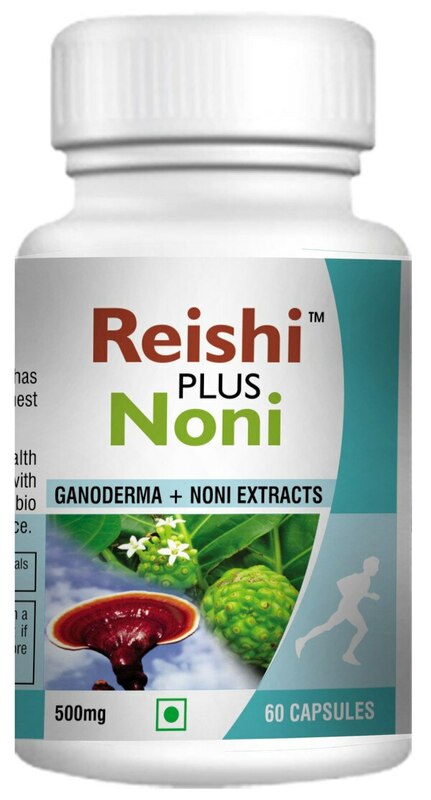 Health Benefits of Reishi Noni capsules: A Strong Immune System with Morinda Citrifolia. Stress reduce and joint relief. Healthy Energy Levels. Helps to keep the natural Immune balance. 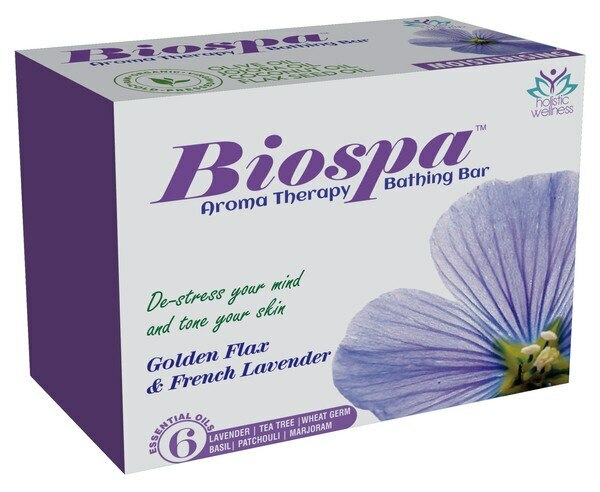 Biospa - Handcrafted Bath Soap (75g each x 3) Natural hydrating, refreshing formula of this natural bath soap can hydrate and mask all the sensitive areas of the skin. It can refresh, rejuvenate, stimulate, balance, soften and smoothen the skin. Health Benefits: • Free from any chemicals and detergents or any animal substances. • No artificial fragrances, synthetic colours, preservatives and no toxins added. • 100% certified organic and natural handmade soaps. • Fresh clean scents with virgin olive oil, jojoba oil, neem oil and coconut oil. • This aromatherapy soap is enriched with 6 and more essential oils like lemongrass oil, tea tree, wheat germ, basil, marjoram oil, palmarosa oil, patchouli and these can do wonders to the skin without any side effects. 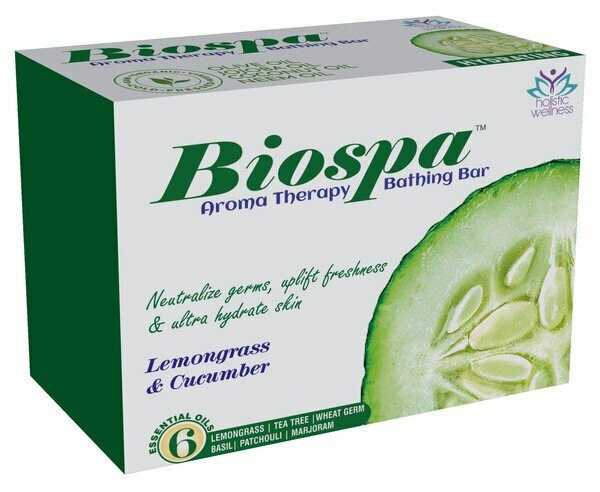 • Soaps are enriched with natural glycerin, aloe vera, avocado gives brighter skin complexion and youthful looking skin. Biospa - Handcrafted Bath Soap (75g each x 3) This natural moisturising bathing soap is enriched with flaxseed and lavender essential oil. It gently and effectively cleanses the skin. And this skin care formula removes body completely and leaves a pleasant aroma on the skin after bath. Health Benefits: • Free from any chemicals and detergents or any animal substances. • No artificial fragrances, synthetic colours, preservatives and no toxins added. • 100% certified organic and natural handmade soaps. • Fresh clean scents with Flax seed oil, virgin olive oil, jojoba oil and coconut oil. 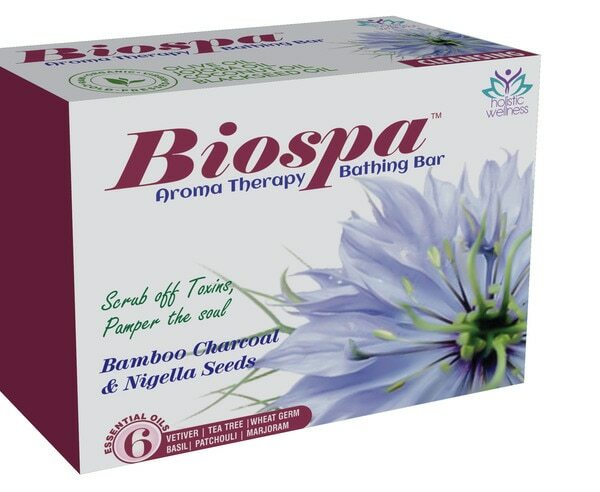 • This aromatherapy soap is enriched with 6 and more essential oils like lavender oil, tea tree, wheat germ, basil, marjoram oil, palmarosa oil, patchouli and these can do wonders to the skin without any side effects. • Soaps are enriched with natural glycerin, aloe vera, avocado gives brighter skin complexion and youthful looking skin. Bioral is Natural Whitening Toothpaste it has 18 more effective bio active ingredients like turmeric, black pepper, cinnamon, green tea, marking nut, black salt, acacia catechu for all teeth problems, complete oral and gum care. We can boldly claim that this is the first toothpaste in India has 18 bioactives with curcumin and the only toothpaste can give 12 hours freshness guarantee. Bioral toothpaste is sugar free toothpaste sweetened by stevia leaf extract and no other sweetening agents and can use by diabetic people also without hesitation. The another uniqueness of this toothpaste is it does not have cancer causing artificial foaming agents and it is paraben free, PEG free, saccharin free, triclosan free and no animal test done natural toothpaste.